Potato Salad is a favorite side dish for summertime meals. I don't make it as much as I like to eat it, but when I do... watch out because I can eat it as a full meal. 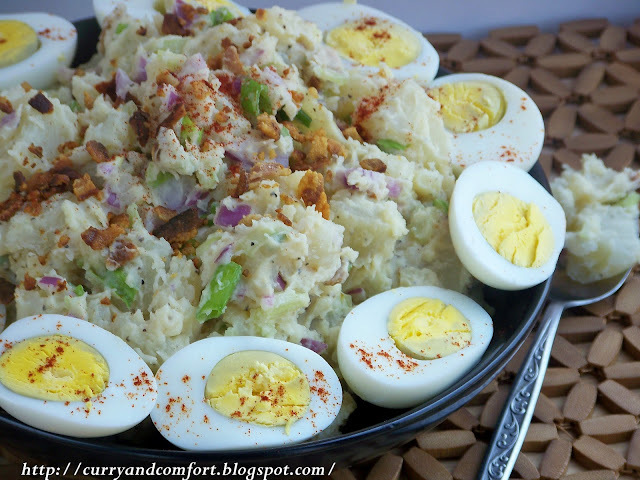 You can make this potato salad with or without the eggs. I know some people crush eggs into their potato salad, but I don't don't like the texture of the boiled egg whites to compete with the potato. Instead I boiled the eggs and put them as a garnish alongside the salad. 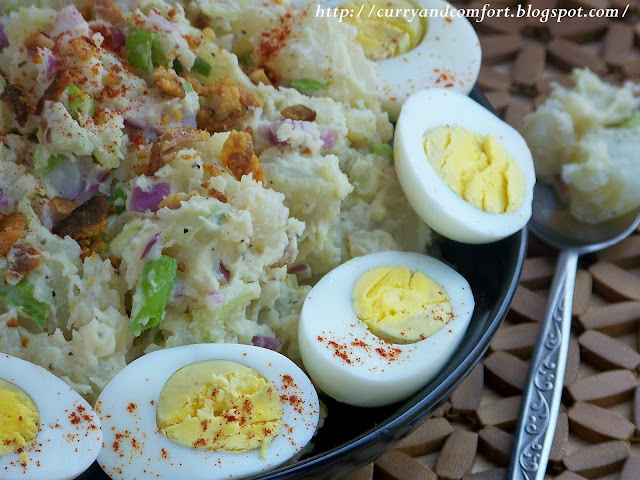 My husband, daughter and I relished this entire potato salad. Of course my son who is not keen on onions had me pick them out for him and then he gave his picky-eaters thumbs up. Peel and Cut potatoes. Boil in salted water until fork tender, but not so soft it can be mashed easily. Allow potatoes to cool. Add with all other ingredients. Adjust to taste. Serve immediately for best flavor, otherwise served chilled. I find when it's too chilled the flavors are more muted. Enjoy. Yum, bacon makes everything better :) I like the addition of a chili or two as well! Funny, My potato salad post goes up in a couple days. I am one of the egg loving ones, but yours looks scrumptious. I would just pile it on top of the egg and take a huge bite. Good way to please both the egg lovers and non egg lovers. Looks so good. 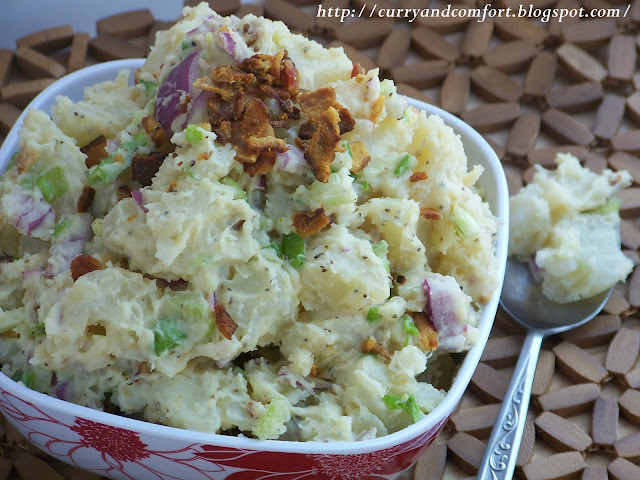 I'm not the biggest fan of potato salad, but the one I make is hot and has bacon in it too! I actually think I could turn my tastebuds around and make me LOVE it! Buzzed ya! That has got to be the best presentation of potato salad I have ever seen! I LOVE potato salad! It reminds me of living in the midwest where my family would always make it for any cookout we would have. Yours looks great! Thanks for sharing it! The perfect summer salad. This looks really good and I am glad you put the eggs on the side, it does ruin the potatoes, LOL. When I was a kid I hated onions in potato salad too, but now I love onions in there. Happy Day to you my friend. I'm not always a huge potato salad fan, but yours looks really good--I love all the flecks of color in it. I really need to hone my potato salad skills. I'm sure this recipe will be a hit with my family. The bacon is wonderful. Just recently, I started adding onion to my potato salad. It's amazing what difference it can make! Your salad looks gorgeous, Ramona! Lol, we must be on the same wavelength. 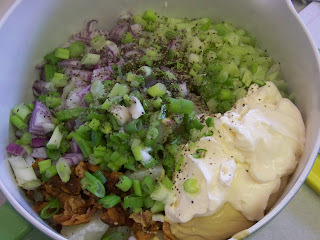 I made potato salad a few days ago and just posted a recipe too :) Yours sounds great! 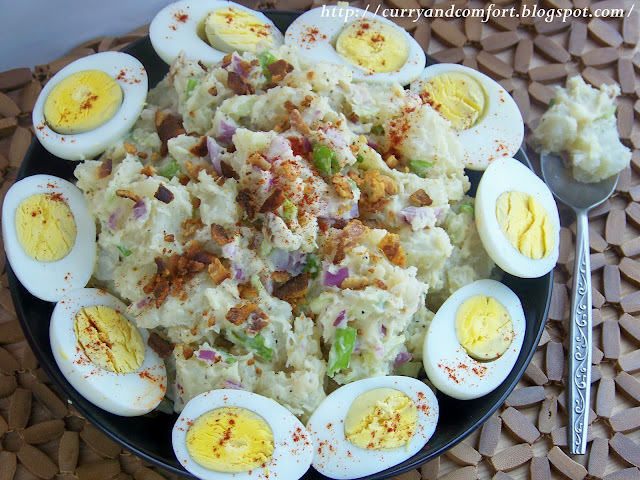 A big bowl of potato salad totally makes an acceptable meal on it's own! And you can never go wrong with adding bacon! I could eat this for dinner just the way it is! Great combination and excellent presentation. you. Daher sind sie in der Lage, ihren Kunden den bestmoglichen Trainingseffekt zu geben.